I am the owner of Southwest Canyon Adventures in Nevada. I have over twenty years teaching experience in various disciplines. Background in Environmental Health & Safety, Firefighting, Fire Prevention, Medical, Emergency Response, Technical Rescue, Search & Rescue, Canyoneering and more. I have a passion for teaching, mentoring and working with like minded people. 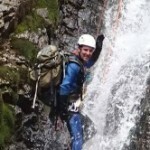 I enjoy Canyoneering, Caving, Mine Exploring and other outdoor activities.